I’ve written about this nearly every month since starting the Fish Wrap. . . For me, the last week of each month starts out the saddest of the year. I mourn each piece of art coming off the walls and stands. The feeling of loss is palpable. And like clockwork . . . the nail holes get filled, patched and painted; new art loads in, and the new show slowly starts to take shape. Magic. Happy. Marvelous. The worst week of the month, without fail, becomes the best. In case you’re not following us on Facebook and Instagram, (and please, please, please do), I’ve been posting daily on the breathtaking symphony of fiber art shaping into the show under the expert ministrations of Board Member and fabulous artist Brit Freda, Gallery Business Manager Lynann Politte, and a host of fiber artists lead by Myra Willingham, Sue Willingham, and Sharon Schoen. By the time you read this, the show will be hung, dressed, fluffed, and ready for its big debut. All I can say is you simply have to see it live. Fiber-fever seems to have spread to our Blue Heron classrooms, too. Thursday’s Late Start Arts (2ndto 5thgraders) class decided to take the lead of teacher Meredith Neal Pickerel, and “yarn bomb” the bike racks outside the Kay Hall and the Blue Heron! Proving you just can’t start too you, the resulting work is as subversively colorful as you would hope—sewn felts and fabrics, more finger knitting strands than a two-hour class should produce, gorgeous kid-centric designs all wrapped around the bike racks. When you come, make sure you get up close and notice the detail. Like the little snaps Meredith installed so her artists could retrieve their creations at the end of the month . . . yeah it’s hard to send your work out into the world, kids . . . we get it. Tuesday evening was the final showing of dance pieces submitted for our upcoming Original Works 2019 dance concert. This showing required all pieces to be complete, including edited music, full costumes, and complete cast. Ummm, wow. It’s a massive understatement to say the panel of adjudicators was impressed with the variety and quality of dance and music. We have everything from Classic Rock to Rachmaninoff as backdrops to beautiful Classical Ballet as well as pieces that will make you think. Take it all in March 22, 23, 24 at The Kay. We’re hard at work preparing for the 2020 edition of our annual Garden Tour, this one to feature a richly textured contemplation of how we steward our little island in the Salish Sea, with special attention to the centrality of planting and caring for native species. More on that later. 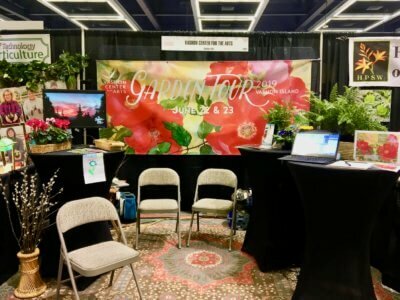 To help us set the table, a very large group of intrepid and committed VCA volunteers lit up the show floor at the annual Northwest Flower & Garden Show, over in Seattle, just on the other side of the new tunnel and daily-departing Viaduct. Anchored by a stunning piece of original art lent us by island artist Ilse Reimnitz, our story was told by Carol Eggen, Susan Kutscher, Jenny McMurdo, Mary Carhart, Whit Carhart, Ele McNamara-Blad, Stephanie Jewett, Mary Langland, Tom Langland, Kim Jackson, Cathy Winjum, Lauren Winjum, Sam Winjum, Randy Winjum, Maria Glanz, Kate Kraay, Marcia Bruya , Todd Pearson, and Mary Margaret Pearson. They gathered emails, and got us all excited about showing-off our island as many of us see it, love it, and care for it plant-by-plant, day-by-day. We hope you’re agree we’re on a classical music roll. This weekend we’re showcasing both Vashon-Maury Chamber Orchestra and Vashon Chamber Music. 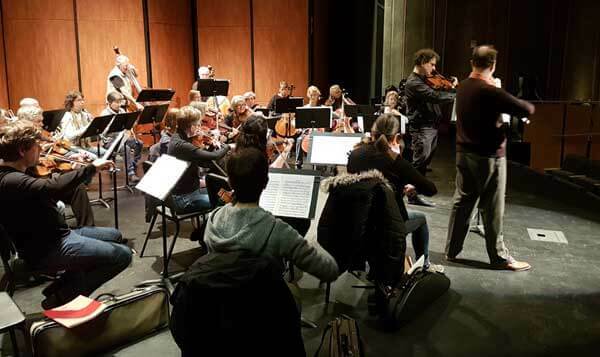 We had the opportunity to play with Symphony Tacoma soloists, Svend Ronning and Thane Lewis for the final rehearsals of Saturday night’s concert. The acoustic shells are up, gathering the sounds of horns and oboes and strings tuning—alongside the best kind of friendly chatter. All a warm-up for the work of bringing music to an audience. And after weeks of practice, the orchestra is ready, and thrilled to share this concert program with you. Do not miss this wonderful concert—so many talented islanders and friends, pulled together under the steady, keen direction of Karin Choo and Justin Cole! But—and this is an important tip—get your tickets ahead of time for the best price and the perfect seat. And, while you’re at it . . . buy one for a friend or two. They will absolutely thank you for it. And why stop there? Why not make it a weekend and come help Vashon Chamber Music kick off its 10th Anniversary season with Cello Virtuosity III. Seattle Symphony Principal Cellist Efe Baltacigil and his regular pianist collaborator Jessica Choe will be joined by new Seattle Symphony Concertmaster Noah Geller for a program of masterworks for cello/piano duo and piano trio. Word to the wise, Cello Virtuosity II was a near sellout! Having said that, let me explain why. Peter is, deep in his bones, a poet in every dimension of the appellation. He quotes poets and poetry with the fluidity and confidence of someone who has read deeply. His lyrics are elegant testimony to his own mastery of verse. His skill at weaving his own as well as the works of others into powerful songs is really remarkable. Some of the best lyrics and storytelling I’ve heard in a long time. Speaking of storytelling, he’s a master. If you listen to any of the following clips, and collectively there is a lot here, I think you’ll agree with me. Finally, he’s a marvelous guitar player. Spellbinding in person. If you get the chance (hint, hint, stay tuned) to hear him, grab your friends and grab a fistful of tickets.